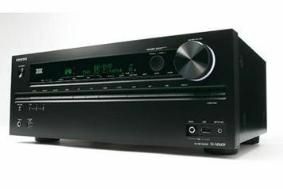 BRISTOL SHOW 2011: See Onkyo's new 2011 AV receivers and flagship hi-fi | What Hi-Fi? The 7.2-channel TX-NR609 is THX Select2 Plus certified, and is the first home cinema receiver in the world to use the Marvell Qdeo video processor, allowing upscaling of video to a maximum of 3840x2160 pixels (aka 4k resolution). Networking is built-in, either through built-in Ethernet or an optional UWF-1 wireless USB Adapter, giving an IEEE 802.11b/g/n Wi-Fi connection to all Onkyo network-capable receivers with a USB port. Audyssey DSX decoding, 2EQ, Dynamic Volume and Dynamic EQ are also provided, and there's a new overlaid GUI for easy set-up. The budget TX-SR309 drops networking, Zone 2 and Audyssey features, and has three HDMI inputs. For more details of the 2011 Onkyo range, see our original news story and blog.